Topics: Clean Room Validation, Clean Room Equipments, Panel Filters, Clean Room Accessories, Hydraulic Filters, and Dust Bag And Filters. It is hosted by Ecommerce Corporation (Ohio, Columbus,) using Apache web server. There are 2 Nameservers, ns12.ixwebhosting.com, and ns11.ixwebhosting.com. 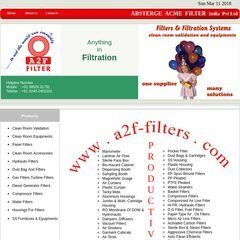 A2f-filters.com's IP address is 98.130.232.2. PING www. (98.130.232.2) 56(84) bytes of data.